Rich joined FSC in 2016 in support of FSC’s patent litigation practice. 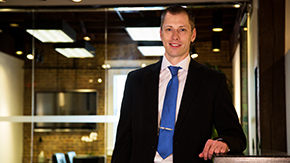 Prior to joining FSC, Rich’s practice focused on patent prosecution, obtaining patents for electro-mechanical devices including RC vehicles and HVAC systems, control systems, medical devices, and software related inventions. Rich’s work in these fields built upon his engineering and electronics knowledge gained through his service in the U.S. Air Force, where he maintained sophisticated airborne radar equipment, and his studies and work in the field of mechanical engineering, having worked at Lennox Industries for several years designing commercial HVAC systems and controls before law school. This winding path leading Rich to his ultimate career in patent litigation provides him with a broad base of technical and practical knowledge to rely upon in enforcing the intellectual property rights of his clients. © 2015 Friedman, Suder & Cooke, P.C. Site by Ardent Creative Inc.